History of Victor Thuillat's Park : This quiet area, which covers nearly 8.5 acres, has been part of the ancient farm called La Grange - Garat during the 18th century, nowadays, what remains of this is an old may (200 to 25 years old) and some yews. At the end of the 19th century, Mr Fizot-Lavergne got planned a landscaped garden with an englishlike river and with rare trees (Sequoiadendron, Taxodium, Cedars,...). 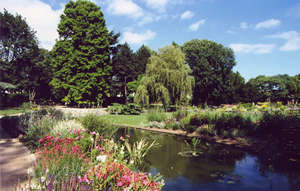 Bought by the town in 1961 and replanned in 1967 and 1997 it gathers, besides its remarkable trees, a collection of perennials and bushes.